(NaturalNews) Do you really know what's in all the food you're eating that's imported from China? If you don't, you're actually in good company: The FDA only inspects 1% - 2% of all the food imported from China, so they don't know either. Even when they inspect a shipment, they rarely test it for heavy metals, pesticides, PCBs or other toxic contaminants. Mark A. Kastel, Senior Farm Policy Analyst at The Cornucopia Institute, added emphasis to this point as he testified this week in The House Committee on Foreign Affairs Subcommittee on Europe, Eurasia and Emerging Threats, saying, "We don't trust, for good reason, the Chinese to supply ingredients for our dog and cat food. Why should we trust Chinese exporters for the food that we are feeding our children and families?" It's a good question. Especially when, as Kastel adds, Chinese food is being routinely found to contain "unapproved chemicals, dyes, pesticides and outright fraud (fake food)." And yet, even with all this being widely known, Chinese farms are rarely inspected by organic certifiers. "U.S. certifiers are unable to independently inspect farms and assure compliance to the USDA organic food and agriculture standards that are required for export to the U.S." explained Kastel in testimony. "These imports should not be allowed to reach our shore until and unless we have a system in place to assure consumers they are getting what they pay for. Just like U.S. grown organic commodities, the safety of these products must be rigorously overseen by independent inspectors." Read Kastel's full testimony here. Also testifying at the hearing was Patty Lovera, the Assistant Director of Washington, D.C.-based Food & Water Watch. The news on food fraud out of China "is a steady stream of controversies ranging from adulteration with counterfeit ingredients like melamine in dairy products, to widespread outbreaks of animal diseases like avian flu, and high levels of pesticide residues," Lovera testified. "Just last week, news reports described a Chinese government campaign to break up a fake meat operation, leading to arrests of more than 900 people accused of passing off more than $1 million of rat meat as mutton." Why does any of this matter? Because you're eating far more food from China than you probably think. Not only do retailers like Whole Foods sell "certified organic" food grown in China, the vast majority of superfood powders sold in North America use raw materials purchased in bulk from China. Nutritional supplements, herbs and vitamins are often made using materials from China. Even more shockingly -- and I seem to be the only journalist reporting this jaw-dropping fact -- there are currently NO LIMITS set by the USDA for contamination of certified organic foods. A product may be USDA organic and still contain deadly levels of mercury, arsenic or lead. The USDA does not test or even regulate heavy metals in foods via its organic certified program! So you can be shopping at a famous natural products retailer and you might pick up a product carrying the USDA Certified Organic logo, thinking, "This is certified healthy and safe by the U.S. government." You are being lied to. That product could be grown in China in a field of mercury runoff from an industrial factory. It could contain ridiculously high levels of mercury, arsenic, PCBs and even chemical solvents. You could be eating pure death while paying a premium for it! In truth, what's really happening right now on a global scale is a massive organic food fraud. Food is grown in China and certified organic even though no U.S. inspectors even visit the farms. That food is then imported into the U.S. and almost never inspected. It's packaged and sold at top dollar in natural foods retail stores, emblazoned with the USDA Organic label. But nowhere along the way -- except in extremely rare cases -- is that food ever tested for heavy metals or other contaminants. This is why Mark Kastel correctly states this food can't even be trusted "for dog food," much less to feed yourself and your family. Make no mistake about it: China is a nation full of immoral, unethical liars and deceivers. (Taiwan, on the other hand, is very different and has a much stronger moral code as well as basic human decency.) Remember: I speak Mandarin Chinese. I've lived in the Chinese culture. I've traveled throughout Asia and even given numerous public speeches to Chinese audiences. At the same time, I've investigated and written about food and food safety for more than a decade. Very few people are as qualified to tell you the truth about what's really in your food coming out of China, and I can tell you that I don't trust it. Almost universally, food grown in North America is cleaner and less contaminated. This isn't true 100% of the time, but usually so. The sad part about all this is that food from China is economically displacing U.S. and Canadian farmers who are generally far more honest and ethical in their farming practices. So while U.S. farmers are being put out of business for following the rules set by the EPA, FDA and USDA, the Chinese farmers are selling us contaminated, toxic "organic" food frauds produced by breaking all the rules! That's why I say grow local, buy local and eat local as much as possible. And until China cleans up its act on food contamination, do your best to avoid food from China. I don't trust it unless EVERY BATCH is comprehensively lab tested and those lab tests are made public. P.S. 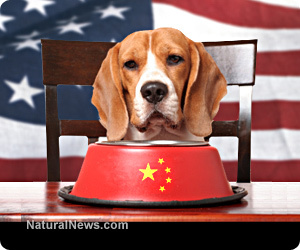 The reason all your dogs and cats are dying from diabetes and cancer these days is because you're giving them highly toxic pet treats imported from China. They are loaded with toxic solvents and industrial chemicals that cause permanent liver and kidney damage, among other devastating side effects. You can find these toxic, colorful pet treats sold at all the major pet store retailers. They are selling you PET DEATH and making a tidy profit doing so.